A local man from Nam Yang village joined us for the trek. The driver waited behind for our return later. 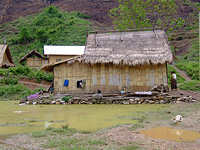 The village guide was called Thi Ja, the trek guide's name was Thanon Xai. We began our trek through the jungle, gentle walking at the beginning of the trek. Thi Ja carried all our water and packed lunches on his back with a large machete tied around his waist. On the way he cut 4 lengths of sturdy tree branch for us to use as a walking sticks. This was to become so useful later on to steady ourselves on the wet and difficult terrain. The difficulty began only after 20 minutes of walking. We started to descend down a wet and muddy path. The fallen trees and branches along the way became our helping hand and support. The stick that Thi Ja prepared for us so brilliantly also became an extra arm to steady ourselves against falling. Unfortunately both Rob and I fell quite a few times. Thi Ja was only about 5 foot 3 tall and very slight but he held onto me when my feet slipped whilst still steadying himself. Without his help I would have fallen down badly into an unknown jungle of trees and mud. Thanon Xai was assisting Rob too. To ease the pain and worry Thi Ja began to sing his mountain songs beautifully. Occasionally he would change to imitate the different sounds of the birds and insects. He lives in this jungle. It was a relief when we reached the stream at the bottom but we still had a final fall on the most slippery and treacherous path down to the stream below. I think both Rob and I just slid down on our bottoms with the help of fallen tree branches. Across the little stream there was an open wooden platform with a thatched roof where we settled down for our break and lunch. Thi Ja quickly chopped 4 big banana leaves from the tree and laid them on the platform as our table cloth and seats for lunch. Thanon Xai also unwrapped hand soap for us to wash our hands in the stream. Our lunch was unpacked onto the banana leaves - omelette, pork with vegetables, chicken and sticky rice. There was no cutlery so we ate with our hands under the song of birds and insects among the jungle trees. That day was Rob’s birthday. It was the most unusual birthday meal that he has ever had. The rain had stopped and the sun came out. After lunch going back up via a different route also was difficult. We climbed through rocky paths up steep slopes. We stopped for breath but our two guides showed no sign of fatigue. I play tennis back in UK but cannot compare to the fitness of these 2 local guides. They told us that this was a m edium trek but the wet condition that day made it a difficult trek for us. When we came across a group of local women and children carrying water from the jungle I realised that we were nearing the finishing line. 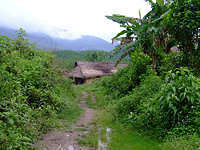 We were heading back to Nam Yang village. As the children from the village saw us walking back from our trek they called out ‘Sabaidee’ to us. It is the same as ‘Hello’. The villagers came out and followed us into their village. We were wet and dirty and covered with mud I felt like as if I had been to the war and was now being welcomed home by the villagers. The warmth of these village people is overwhelming. They are Akha people. I felt so happy and I was so pleased that we did it. Although we fell and slipped many times both Rob and I were not injured at all, but I would not try it again on a wet rainy day in the jungle. We were invited to the house of the village chief, Phew Ja, for a gathering. He first offered tea as refreshment followed by a bottle of home made rice wine. We drank several rounds. An older woman among the gathered crowd kept on shouting at the village chief until he got up and brought us 2 little gifts from his house. The same woman also kept pokeing her finger at Rob's and my arm as if to test that we were both ok after the trek. Although we could not communicate verbally because of our different languages, hospitality and happiness became more important than words. Before we left I willingly offered a donation to the village chief for his village and its Akha people. 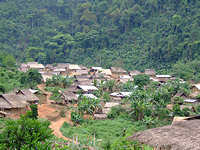 The Akha people are very poor and any donation is helpful for the village children and the school. We left Nam Yam village full of happiness. Next morning we left Namtha to Oudomxay.